How can you go from a life that you have—to a life that you love? This is the topic of conversation in this week’s episode of The Doctor’s Farmacy. 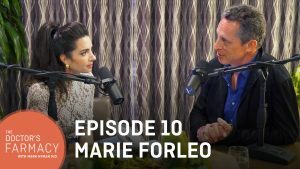 Named by Oprah as a thought leader for the next generation and one of Inc.’s 500 fastest growing companies, my guest on this week’s episode, Marie Forleo, has a mission to help people build a life they love and use their gifts to change the world. She’s the creator of the award-winning online show MarieTV with over 38 million views on YouTube with an audience in 195 countries. She’s also the founder of B-School, an online business school for modern entrepreneurs. In this episode, Marie and I get personal and talk about shame, vulnerability, criticism, children, relationships, purpose, and so much more. Marie empowers us to get inquisitive and really tap into what it is that we want for ourselves versus what others want from us. Marie shares a powerful tool for handling criticism. I know that for so long I personally became wrecked by criticism, and it took me a long time to handle criticism with grace and to be able to be discerning. What is valuable and what is unhelpful when it comes to criticism? One of my favorite parts of this episode is when Marie reminds us that the more we care about what other people think, the more they own us. The good news is that there is a way out of this line of thinking, and sometimes it comes with age, but mostly it comes from engagement and not thought. If you really want to get clear on improving your life, you need to take an active role. Sitting around thinking about the life you wish you had doesn’t change a thing. But when you’re empowered, and when you take a motivated and informed approach to create a life you love, big things happen regardless of what others believe about you. So much of what we discuss involves stepping out of our comfort zone and into what Marie calls the growth zone. Engagement guides us into that growth zone and allows us to pursue a life we love. As a business person, Marie shares the importance taking care of our bodies and minds. Many of my patients who are CEOs and entrepreneurs tell me they don’t have time for health. Marie is living proof that prioritizing your health only makes you more successful. 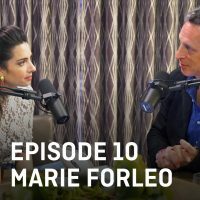 Finally, Marie and I discuss a topic that is near and dear to me, the power of community and the idea that friend power is more powerful than willpower. As a physician, I have seen the power of community in coming together to help my patients. We also know that the company we keep can inspire us to become the best version of ourselves. I hope you enjoy this episode of The Doctor’s Farmacy as much as I did. Be sure to listen in on iTunes or anywhere else you access podcasts or watch our conversation on YouTube.